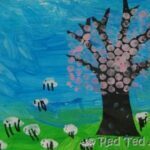 A few weeks ago, we were having exploring with Bubble Wrap Printing. 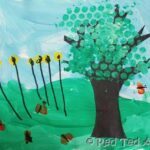 It was something that we hadn’t done in aaages and the kids really enjoyed the process of painting and seeing all those little bubbles “emerge”.. lots of printing was done (and now we have lots of “wrapping paper all readily made”). 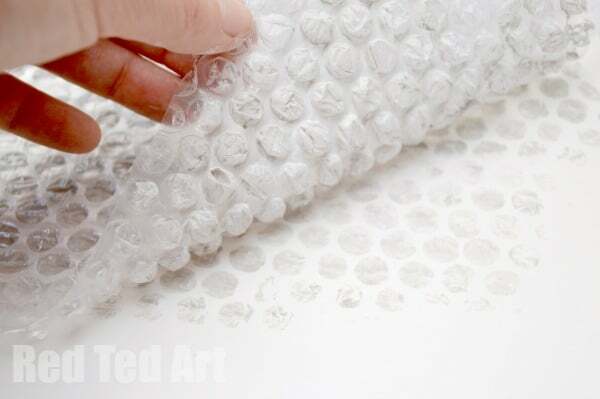 We also thought about different craft projects that would look nice using bubble wrap. 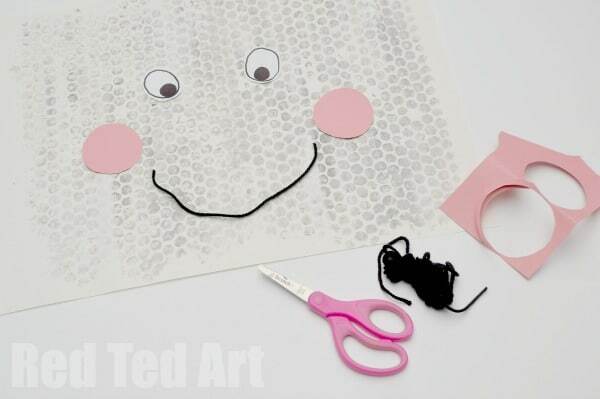 At the time we made some cute little sheep mobiles.. and then we had a go at this Bubble Wrap Rain Cloud! 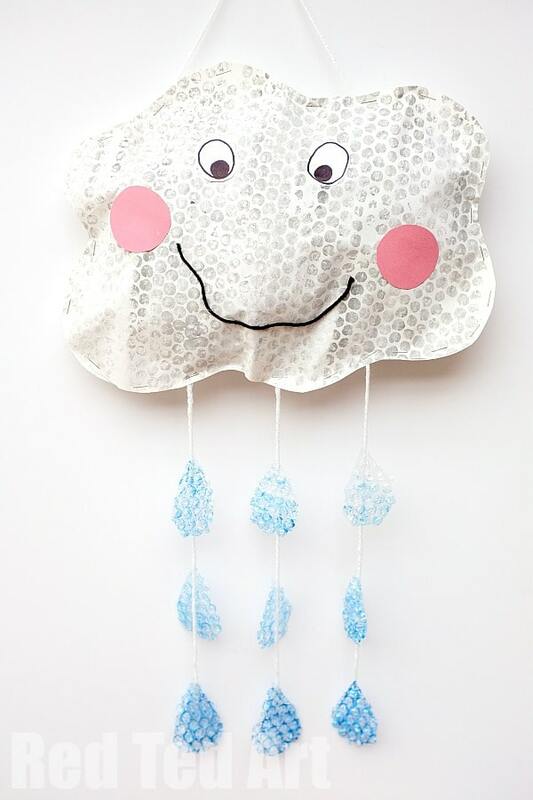 We were inspired by this (somewhat different) rain cloud craft (aren’t they just the cutest?!) to have a go at ours! So we went from this…. Note: this post was first shared in April 2015 and has been updated and reposted for your convenience! 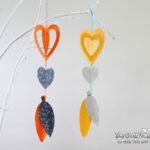 We started off with printing our grey cloud. We squired lots of white and a little (very little!) 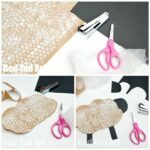 black onto our bubble wrap and using our paint brushed covered the whole sheet of bubble wrap. Then pressed it down onto the whiet paper and carefully peeled it off. 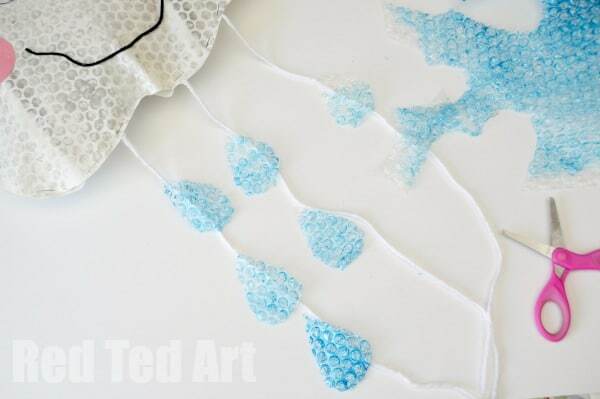 Whilst the grey print was drying we painted some more bubble wrap blue. And let that dry (note, this will crumble a bit over time, but on the whole ours has lasted very well). It doesn’t matter if the paint isn’t applied evenly, as raindrops are not an even colour either (are they?! Mmmmh). 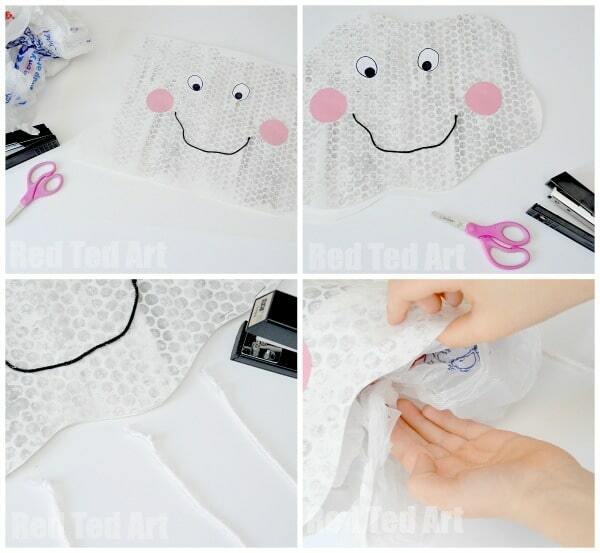 Next we cut out some shapes for the eyes and and cheeks. Of course you can draw these on too. Once these were stuck on, we cut out a big cloud shape (cut both pieces of paper “back to back” at once to get two pieces the same size. 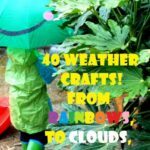 Next we got our stapler ready and some white wool to hold the rain drops. We stapled this in place, went all around the cloud with the stapler and left an opening for stuffing with plastic bags. Finally, we cut out some rain drops and glued these into place. 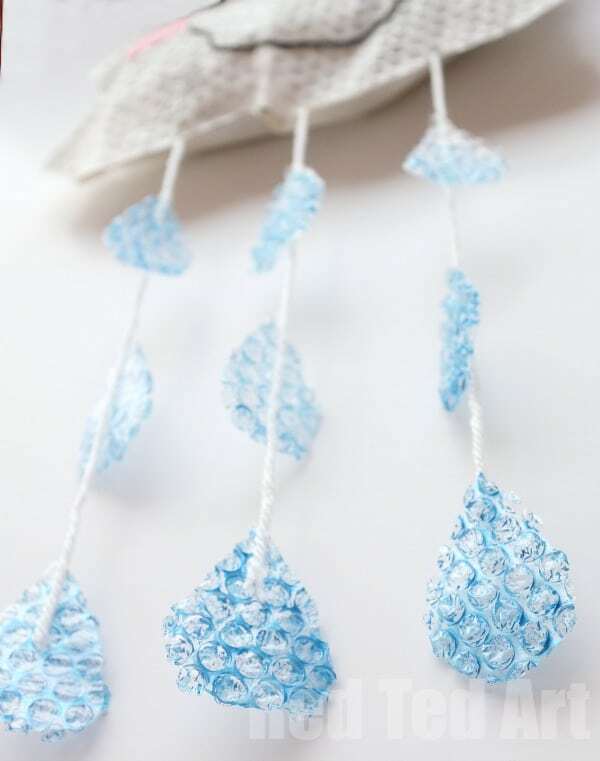 Let dry… and ta-daaaaaa we have a gorgeous Bubble Wrap inspired Rain Cloud Mobile! Wishing you a lovely day! 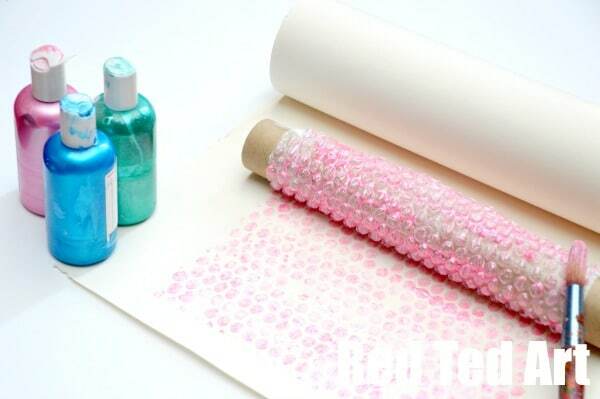 Hope you have some fun with Bubble Wrap Printing in the future! 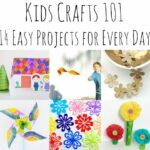 Kids Crafts 101 – 14 Gorgeous Kids Craft Ideas for Any Time Any Day! Oh I am so pleased to hear it! Have lots of fun!!! If you use coloured plastic, you can make great art by melting the plastic on your base. E.g. blue for the sky, red mixed with orange for ground or a house, green word hills, grass, trees and white for the fence. 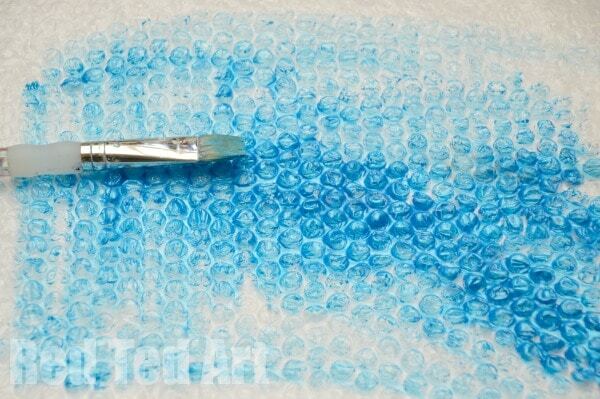 This is an amazing and most creative use of bubble wrap. The bubble wrap drops and color print looks just wow.